Are you in search of your first camp stove or grill? Perhaps you’ve owned one in the past but aren’t quite certain which one you will best serve your needs at this point in time. I made it my mission in creating this page to bring you the best of today’s most popular, top-selling camp stoves and grills to make your search for the perfect stove/grill easier and much less overwhelming. 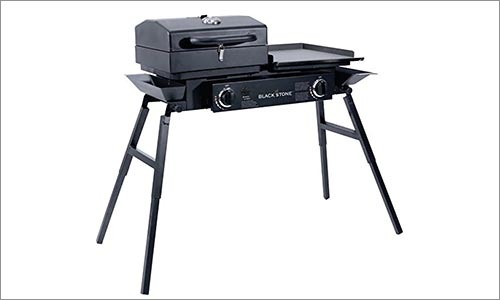 On this page, you will find a list of 12 camp stoves and grills. Each of these stoves and grills is different from the last, but each offers something of value. They have proven themselves to be popular among consumers in terms of their sales statistics and the rave reviews they have all received. This list includes tailgate-style camp stoves large enough to feed a large family. It includes small, easy-to-transport, one-burner stoves built for the avid backpacker. It also includes portable grills designed to mimic the cooking environment offered by a backyard barbecue. If you aren’t sure exactly what you are looking for, you may find it helpful to review our buying guide. Our article about BTUs and fuel types may also be beneficial to your search. To make things easier for you, I have selected my Top Three Choices of camping stoves and grills and separated them into their own section. While I must admit that these are my personal favorites, I also selected them based on their popularity among consumers. After hours of research, I found that these three received the best consumer reviews in each of their categories. A quick look at some of their impressive features will demonstrate just how great each of these Top Three Choices is and why consumers made these the most popular. I have also included longer reviews on separate pages for each of these Top Three Choices, because I simply could not fit all of their wonderful qualities into the limited space I have available on this page. If you do not find that one of these Top Three Choices is right for you and your personal needs, or if you would like to compare them with other popular, top-selling stoves and grills, continue reading further down the page for short reviews of nine more popular camping stoves and grills. As I have already stated, I selected each of these Top Three Choices based on their positive consumer reviews and ratings. In addition to receiving the top reviews and ratings from consumers, this Solo Stove also boasts being one of the most environmentally-friendly stoves on this list, because it uses an extremely renewable natural resource – wood. Despite the fact that wood is readily available (especially during hiking excursions), most camping stoves utilize more fail-safe cooking fuels such as propane or alcohol. While the convenience of gas and liquid fuels cannot be denied, there is something to be said about cooking the old-fashioned way. Additionally, wood-burning camp stoves are much easier to transport for backpacking trips. You needn’t carry heavy canisters or containers full of fuel on your back and lug your gear from one rest stop to another if you use wood as your fuel source. Instead, you only have to carry your stove and, possibly, a few sticks. The Solo Stove Lite is built to use the least amount of wood possible, to make less of an impact on the environment. A small handful of sticks or twigs are all you will need to get this stove burning hot enough to boil water within 8 to 10 minutes. 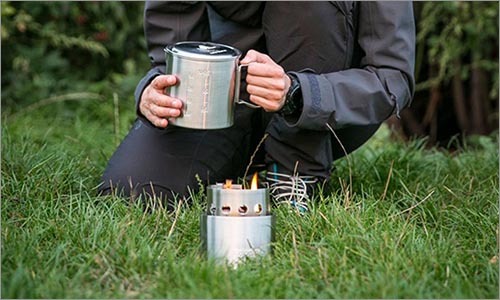 Speaking of handfuls, this small, easy-to-transport stove boasts a handful of other important and impressive qualities I am excited to tell you about. Unfortunately, I do not have enough space to cover them all on this page. The first question some of you may have is: What is a tailgate-style camp stove? Unlike a backpacking camp stove, tailgate-style stoves usually feature at least two burners. They aren’t collapsible and usually take up a fair amount of space. Some come equipped with legs or stands, whereas others are made to sit atop a table, bench, or even the ground. This Camp Chef Tahoe stove earned the title of “Best Tailgate-Style Camp Stove” based on a few key factors. First, and most importantly, of all the tailgate-style camp stoves reviewed on this website, it has received the best reviews by consumers. If you have visited any of the other gear pages on this website, you will have noticed that positive consumer reviews are a basic qualification for being included on this website. Overwhelmingly positive reviews which rise above the reviews given to other, similar products are what help to push a product up into this Top Three Choices. This Camp Chef received reviews which were much more positive than those handed out to any of the other stoves on this page. Of course, consumer reviews cannot be the sole basis of a decision like this. Obviously, this stove must hold a handful of other great qualities, since great qualities are what usually prompt consumers to hand out such positive reviews, in the first place. I created a separate review page for this stove which covers all of its impressive qualities, including its removable legs, multiple controls, and incredible cooking power. 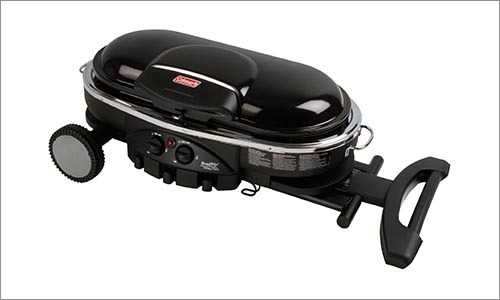 Campers in search of a barbecue-style meal are bound to be impressed with this Coleman grill. As I am sure you have guessed the majority of consumers were rather impressed with it. 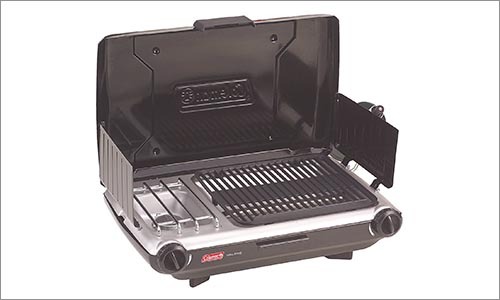 Coleman actually put out an entire line of Road Trip grills, of which this LXX is the top model. It boasts the best features and most impressive craftsmanship. This portable grill sits high atop a stand which will allow you to cook with ease as you stand around chatting with your fellow campers. Built mostly of stainless steel and cast iron, this grill can feel a little heavy if you attempt to carry it over long distances. To keep things simple and easy for you on your camping vacation, Coleman designed this grill to collapse down onto its folding stand. One leg of the stand turns into a set of wheels, while the other turns into a handle so that you can pull it along with ease. Two 11,000 BTU burners, an ignition button, non-stick porcelain coating on the grill, stainless steel side tables, and an easy-to-read temperature gauge are only a few among the many remarkable qualities and features built into this grill. If the Coleman Road Trip LXX is a little more grill than you need or slightly outside of your price range, take a peak further down this page at the Road Trip LXE. Though the LXE is a little less impressive, it still boasts quality craftsmanship and a similar design. On the off chance that one of my Top Three Choices didn’t have the specifications you are looking for in your next (or first) camping stove or grill, I have included nine Runners Up in this section. Take some time to read through the following reviews to see if one of these stoves, grills, or combination units may be the right fit for your next camping experience. 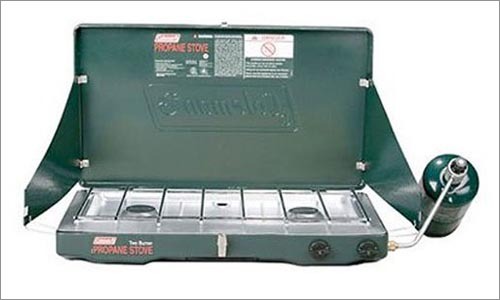 This tailgate-style camp stove features two burners and two separate temperature controls, and runs primarily on 16.4-ounce canisters of propane. You can easily select one temperature for one burner and a different temperature for the other. 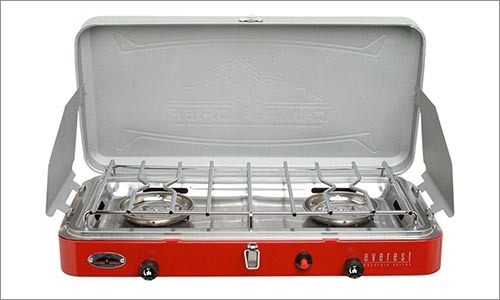 Boasting an impressive 20,000 BTU per burner, the Camp Chef Everest should never fail to impress in its ability to quickly boil water or heat a pan. In fact, this stove will even boil water and heat pans quickly in windy weather thanks to its built-in wind shields. The wind shields can be removed to accommodate oversized griddles or long handles of pots and pans. Cleaning this stove will be easier than cleaning many others, thanks to its removable stainless steel drip tray. Though I would, personally, prefer a more non-stick drip tray, I am quite pleased to see that this one can be removed. I have wasted far too much time struggling to reach behind burners and into difficult cracks and crevices when the time comes to clean the stove. A lid lock feature makes transportation easier, as you will not have to worry about damaging anything inside the stove. The lid lock will also help you contain some of the drippings which may have missed the drip tray as you transport it home for a quick and easy clean under the garden hose. Weighing in at only 12 pounds, a group of people could easily disperse weight between their packs to accommodate one person carrying this stove in his or her backpack for short hikes. To make it easier to carry this stove from one area to another, Camp Chef also includes a carrying handle. This small, one burner stove is perfect for backpacking. 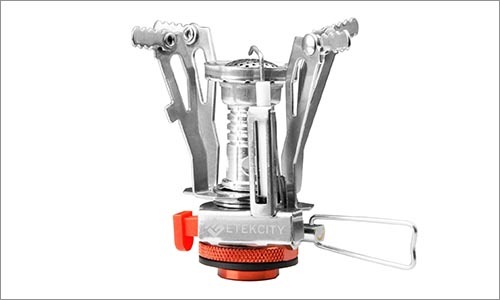 Etekcity built this stove from stainless steel and aluminum so that it would easily withstand damp conditions without rusting, while still being lightweight enough to compete with other backpacking stoves. The entire stove can collapse into a hard plastic carrying case which is small enough to slip inside a pocket. The carrying case protects the stove from being crushed by other items in your pack or from snagging on things as you try to remove it from your pack. The stove is designed to sit atop a small canister filled with butane or a mixture of butane and propane. Unlike many stoves of this design, the Etekcity Ultralight features a temperature control valve which allows you to adjust the size of the flame depending on your specific cooking task. Of course, most of what you will be doing with this stove will involve heating or boiling water, since your cooking will be restricted to pots and cups, as it is not made to handle the uneven weight of a pan. Basically, this stove is a regulator and four steel arms which attach to the top of a canister. The regulator allows you to release a flame and the four arms hold the cup or pot over the flame. Like many other tailgate-style camp stoves, bringing the Camp Chef Explorer on a camping trip feels like bringing a little piece of home. Of course, that piece would be a piece of the kitchen. This large two burner stove has received noteworthy reviews by impressed consumers who have a lot of great things, and very few negative things, to say about this stove. The Explorer is built for a serious cookout. Boasting an incredible 30,000 BTU per burner and a 14-inch by 32-inch cooking surface, this stove will allow you to effortlessly boil huge pots of corn or pasta for large groups of people in as little time as it would take in your home kitchen. With the right accessories, you can cook almost anything atop this remarkable stove. Camp Chef sells a grill, griddle, smoker, and drip tray specifically designed to fit this particular stove. Six-inch wind shield panels along the sides and back of this stove protect flames from being blown out and heat from being blown away from the underside of pots and pans as you cook. Removable legs allow you to choose between setting this stove up on top of a table or on its own. 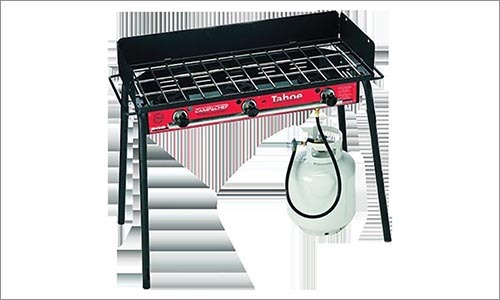 A 5 pound or 20 pound propane tank will be necessary to fuel the powerful Camp Chef Explorer. Anything smaller would simply deplete itself long before it had managed to cook much of anything. If you are planning to camp in the rugged wilderness, this Blackstone combination unit may be just what you need. Before I even get into the fact that this unit can be used as a stove, grill, or griddle, I want to begin by talking about the fact that it can be used almost anywhere. Four collapsible legs allow you to sit this unit atop a table or, if you prefer, to stand on its own. You may be wondering what is so special about this unit that I say it can be used anywhere. You may be thinking to yourself, “Many of the stoves and grills on this page feature collapsible legs.” You would be correct. What separates this unit from all the others is the fact that its legs can each be adjusted independently. They do not simply fold up and out of the way. Instead, they collapse in a similar fashion to the legs of a camera tripod. You can choose to move them an inch, two inches, three inches, four and a half inches, and so on. You can choose to move one leg three inches and another leg four inches. This allows you to cook on rocky and uneven terrain without sacrificing a level cooking surface. One of the two burners built into this unit emits 20,000 BTU of focused heat thanks to a ring of flames. This burner most resembles that of a gas stove and is perfect for cooking using pots and pans. A removable grill box with lid comes with this unit and can be placed atop this burner to grill anything from hamburgers and steaks to corn and asparagus. You may think that dispersed heat would be better for the grill box, but the grate has been forged of cast iron to distribute the heat evenly, so long as you preheat it properly. The other burner features 15,000 BTU spread around a larger surface area, making it perfect for the griddle pan that is also included with this unit. Of course, you can still use other large pans or even pots on this burner. If this grill seems a little familiar, that’s because it is. In the Top Three Choices section of this page you may have seen the Coleman Road Trip LXX, this slightly less-impressive version, the LXE, is much more affordable. Like the LXX, the LXE comes with a stand which transforms into a set of wheels and a handle to help you move this stove from one place to another with very little effort. 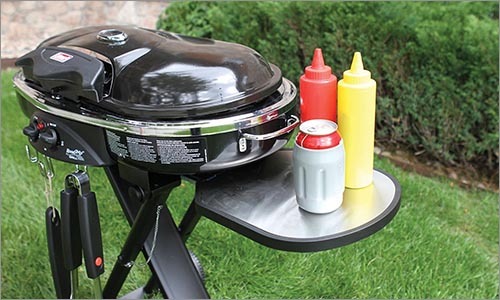 A locking lid keeps everything together as you move the grill around. Two built-in side tables slide out from beneath the grill to give you extra prep area while you are cooking. Campgrounds do not usually offer an abundance of preparation areas, such as picnic tables, so these side tables are bound to come in rather handy. The non-stick, porcelain-coated cast iron grill surface will stay hot for a long time, allowing you to use less fuel after properly preheating this grill. The downgrades on this grill are what make it more affordable compared with the LXX. For example, instead of stainless steel side tables, this stove features plastic side tables. Instead of stainless steel utensil hooks, this stove features plastic utensil hooks. Instead of 11,000 BTU per burner, it only features 10,000 BTU per burner. It does not have a temperature gauge at all. That all being said, I would like you to consider how important a few flashy features and 1000 BTU are to you. If those things aren’t very important, this affordable option may be more your style. If you are looking for an affordable, mid-weight, single burner backpacking stove, this Coleman may be just what you need. Of course, it cannot compare with the backpacking stove I chose to include in the Top Three Choices section of this page. It isn’t as efficient or as easy to transport. Still, weighing in at only 30 ounces, it is much easier to transport than any traditional tailgate-style stove. Running off a 16.4 ounce canister of propane, this stove boasts 10,000 BTU, can boil 2 cups of water in between five and ten minutes, and can squeeze 2.5 to 9 hours of cook time from a single canister. Even if it must be used to feed more than one person, there won’t be much of a lag between the time that one person is served and so is the other. The Coleman shields its flame from the wind much better than many other backpacking stoves. Many of the other models are simply arms atop an open flame. Instead, this stove features a wind shield around the area where the flames come out, to deflect wind away and focus heat up toward the bottom of your cup or pot. Four arms are attached to the wind shield, holding cups and pots in place with their rigid grips. Like all of the other Coleman tailgate-style stoves featured on this page, this one has impressed consumers with its outstanding quality craftsmanship. This stove’s locking lid allows you to ensure that it stays closed during travel so that you can protect the burners from damage and easily stack it along with your other belongings. Two side panels come up as the lid is raised, to deflect wind and keep heat inside the cooking area. These panels can be removed if you are working with long-handled pots and pans, which would not fit otherwise. Like most tailgate-style camp stoves, the Coleman Classic features two burners. Each burner is about 10,000 BTU, making this a fairly average stove in terms of its heat and cooking time. Most of this stove’s features are rather basic. It does not feature any legs or a stand. It runs on 16.4 ounce canisters of propane. It does not have a temperature gauge or side tables and does not come with any accessories. It does not appear that its positive reviews are based on the fact that it is extraordinary in terms of the number of functions or amount of convenience it offers. Instead, it appears that its positive reviews are based on the fact that it is outstandingly ordinary. 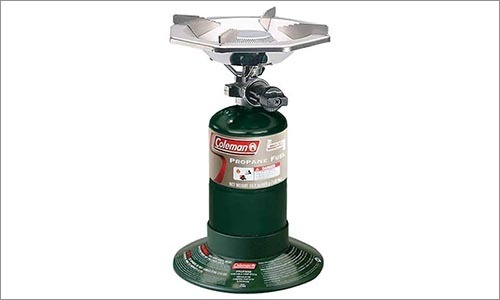 Instead of adding a handful of special features, Coleman appears to have focused their energy on creating a quality stove which is one of the best among those with standard features. 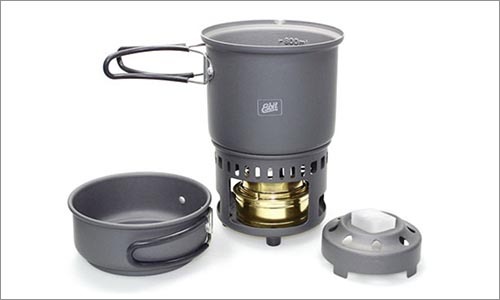 This small backpacking stove comes with two pots: one small and one mid-sized. The small pot measures 470ml or 15 ounces, making it the perfect size for a single serving of coffee or tea. The larger pot is capable of holding 985ml or 33oz which is the equivalent of 2 to 3 cups of coffee or a single serving of soup. The entire ensemble can be nested together to create one small, compact cooking pod for easy storage. Fold-away handles attached to the pots allow you to safely remove them from above the flame without worry about the extra space handles will require in your backpack. Not including the extra weight of the fuel, this entire ensemble weighs only 15 ounces. Many similar stoves weigh more than 15 ounces on their own, let alone with the addition of two pots. In case you were wondering, this stove runs on alcohol. Although alcohol can be a little more difficult to find in North America than propane, it is readily available throughout Europe. Alcohol is actually the preferred camp stove fuel in most parts of Europe. If you are planning to camp overseas, you may want to consider an option such as this one. The Coleman Perfect Flow Grill Stove is a combination unit which features one 10,000 BTU heat-focused burner and one 10,000 BTU grill burner. The combination of a stove and a grill allows you to cook something in a pot or pan while simultaneously grilling something else on the grate right next to it. Quickly and easily boil pasta or rice in a pot on the focused burner while also grilling hamburgers or steak on the grate. For breakfast, you can use a pan to cook bacon on the focused burner while making eggs and pancakes on a griddle pan placed atop the grill side. Approximately two-thirds of the total cooking space has been allotted to the grill. In fact, the grill itself measures an impressive 130 square inches. Do not worry; this still leaves enough space to fit a 10 to 12 inch pot or pan atop the heat-focused burner. If you need some extra space, the side panels can be removed – just be aware that these panels are what block wind from blowing out flames, and so are a big part of what traps the heat. Therefore, I suggest only removing them on days without wind. Two temperature control knobs allow you to adjust the size of the flames on either burner so that you can cook two separate foods at two separate temperatures for optimal results. 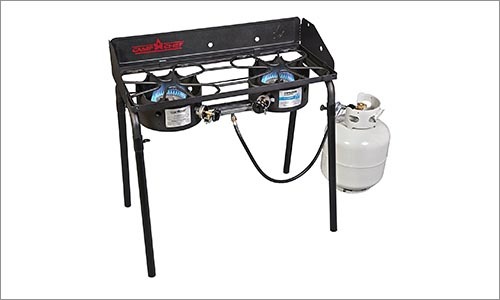 Though this stove/grill combo does not feature a stand of collapsible legs, it does feature rubbery feet to lift it up off of surfaces such as tables and tailgates.